This past weekend I ran in the opening race of the 2015 U.S. Skyrunner Series at the Georgia Death Race 68 Miler (GDR), that ran from Amicalola Falls State Park to Vogel State Park in the North Georgia Mountains. Aside from GDR being the first race of my 2015 year, and the first race of the Skyrunner Series, I was stoked to get down to see and explore the mountains of North GA. 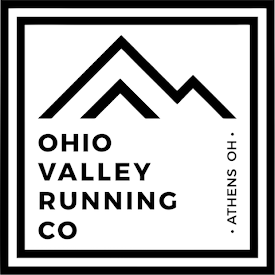 This area is probably a bit unrecognized by a lot of ultra runners around the US, but it is a trail mecca, with the course crisscrossing the Appalachia Trail, and running on the Benton MacKaye Trail and Duncan Ridge Trail. These distinguished trail systems are all well-used by hikers and other outdoor recreationalists and maintained and treasured by local trail associations and other constituents. What it is known for by runners are the dramatic ups and downs, lack of switchbacks, and unrelenting steepness. This rugged and wild terrain definitely became evident during my race! RunBumTours hosts the GDR and Sean Blanton (aka RunBum), the race director, touts the race as death itself. Although I wasn't much into the pre-race antics that went back and forth on the Facebook event page about the course "making you die," "etc., etc., etc." it was certainly evident that this was the "personality" that was wanted to be portrayed about GDR, and evidently there were a few hundred folks who like that sort of thing. I tended to just focus on what was real and present, like the actual course, logistics such as the elevation profile, distances of climbs and where they came along the course, etc., in my pre-race planning and not get caught up the the hype of death race. Training for the Georgia Death Race 68 Miler started once I resumed running after the Grindstone 100 and Columbus Marathon double I ran back in October. This ended up being 19 weeks of solid and uninterrupted (for the most part) training leading into GDR. I guess in summary of training, I ran less mileage that what I am typically used too, ran hard hill workouts almost once a week, and nailed a few really long runs in the 3-6 weeks prior to the race. In regards to the mileage being lower than I am used to, I hit 95-98 miles four weeks and less than that in all other weeks. While this still may seem high, it is much less compared to the 130 mile weeks I was putting in around this time last year leading up to Ice Age 50. I also took 19 days completely off from running in the 19 weeks leading up to GDR - some weeks I took 2 days off, some I ran all 7 days. All of this has been an effort to be more fresh and to set up a long year of racing instead of just fizzling out from over-training as I have been susceptible of in the past. I focused mainly on specificity in the form of hills in my build up and workouts. Although living in SE Ohio doesn't give you any hills over 400' in total ascent, I still focused on hills in the way of repeats and different drills such as bounding and springing. Even if I lack the "mountain training" I am starting to feel confident in being able to at least manage mountainous courses like Grindstone 100 and Georgia Death Race. I also tried to run a lot of elevation in just my normal days of running, and I had a lot of weeks with over 10,000' of elevation gain. The week of the race presented some interesting news from the GDR. Due to conflict between local trail associations, the USFS, and other problems, RunBum was forced to alter the course, and the choice was made to reverse the route direction. Originally the race started at Vogel SP and ended at Amicalola. With the change it started at Amicalola and ended at Vogel. What this did was make the runnable 30 miles of gravel road at the start of the race instead of the end like previous year. This left the last 35ish miles on the grueling Benton MacKaye, Duncan Ridge, and Coosa Backcountry Trails. The notion was that this way would be harder. I was a bit flustered by this at first, because I had spent weeks studying the course, layout, etc., and then 4 days before the race everything was changed, but within a few minutes after the announcement I simply just planned for the course in the new direction because there was nothing else to do. The real work from this situation was from the race committee and volunteers who had months of planning "rerouted." My main concern with the new route was staying controlled on the runnable first half of the course and not go out too fast when I was feeling fresh. The start time was also shifted to 8am instead of 6am. Something else that came up pre-race was my selection of shoes. Shoes are probably the most important piece of gear when running ultras, more so when running in mountains, and as the race approached I didn't feel comfortable racing in any of the shoes that I was training in. So, a week before the race I ordered a pair of New Balance 110v2's, and although I had never worn this model, NB was a brand that I typically fit well with and have experience with. Well, in the two runs that I did with them on Tuesday and Wednesday before the race they rubbed a nasty blister on my right pinkie toe, and it hurt every step. This tight fit was not going to work. So, I packed 4 pairs of shoes for the race to decide later. On the trip down to Georgia from Ohio, I wanted to stop at a few stores to try to find some Montrail Rogue Racers in my size. It has been hard to find the Rogue Racers in my size since they are no longer being made, but when I find a pair I usually grab them up because they have been my favorite shoe to race in. Fortunately, and luckily, the first store we stopped at in Ashville, NC, Black Dome Mountain Sports, had 4 pairs of Rogue Racers on their sale rack and one in size 12! A couple small shakeout runs before the race, and they were ready to go! The race was pretty calm in the early goings, but still featured some stout climbing. We departed from the Amicalola Visitor Center and almost immediately started climbing up Amicalola Falls stairway, which was over 600 steps and nearly 1000 feet in less than a mile. From there we all dropped back down to the starting area on a gravel forest road before going right back up on a paved park road for nearly another 1000' in a mile. During these first 3.5 miles and 2000' of gain, I mainly just focused on conserving energy. Everyone hiked up the falls and then I transitioned from hiking to running up the long paved road. I hooked up with Travis Macy from Evergreen, Colorado for the first part as we were going about the same speed. Coincidentally it was Travis who I borrowed a handful of salt tablets from just 15 minutes before the start of the race, as I was quickly going from one person to another searching for some since I had forgotten my bottle was empty! That helped! It was nice getting to know him in the first part of the race. He told me about a new book he has just published called The Ultra Mindset and I'm looking forward to reading it. We continued to go uphill for another 700' on muddy forest paths to the Nimblewill Gap Aid Station at mile 7.5 at a controlled but still sub 9 minute pace. After the aid station it was a 9 mile downhill dropping almost 2000' before entering the Jake Bull aid station. Although I was still focusing on being in control of pace, and limiting downhill quad pounding, I felt good enough to pull away from the guys I had climbed with and ran the next 4 miles at around 6:35 pace. The grade leveled out a bit and I maintained 7:00 pace until the next climb. In this section I ran into Andrew Miller, an 18 year old from Corvallis, Oregon, who has been running ultras since the age of 14, and who was one of the race favorites according to what I had seen. We chatted a bit and rolled into the Jake Bull aid station. Andrew seemed like he was pretty calm and methodical in his running, and when we started the 6 mile, 1500' climb up to Winding Stair Gap we comfortably matched each others pace. I am probably 8 inches taller than Andrew, and 8 years older, but we seemed similar in how we approached racing. As we jockeyed back and forth up the gravel Winding Stair Gap Rd. we came across the cycling race that was taking place on the same road we were on. We had been warned about this, and it was a bit interesting running up the hill the same speed or faster than the bikers. I chatted with one lady who was astonished that were were running further than their 50 mile ride. Of course, on any downhills, dozens of bikers came barreling down, brakes squealing, the red mud flying. It was somewhat nerve-racking thinking that I could maybe get run over by a biker. As the climb steepened near the end, I stopped to relieve myself and Andrew passed me. I had no urgency in catching back up so I casually ran into the aid station and replenished my supplies with Andrew about a minute ahead. At this point David Kilgore was somewhere even further ahead in 1st place. I had heard he is a 2:17:00 marathoner and that he was a contender. Kilgore set off on a fast pace and it seemed reckless, but anytime there is someone ahead in a race, you need to at least keep check of them. At this point of 23 miles, I knew the race was far from over. More downhills and frequent uphills on forest roads and paths went on for the next 6-7 miles before getting onto the Benton MacKaye Trail (BMT) and the first singletrack of the day. Andrew and I once again exchanged places a few times and was always pretty close to each other going into the Point Bravo aid station at around mile 40. I was really enjoying the singletrack during this section, and still focusing on fueling, hydrating, and staying relaxed. Andrew seemed to be climbing much better than me at this point, but then I could gain a little on downhills or any gradual sections. At Point Bravo I got word that I was just behind Andrew and 8 minutes down on Kilgore. It didn't seem like he had been gaining on us a while now, which made me think that carnage was setting in. I was just hoping I wasn't carnage as well. Climbing out of Point Bravo, I feel that the course drastically became harder and that the real race began. A look at the elevation profile shows the steepness and frequency in the climbs after mile 40, with all of it being higher in elevation than the first half of the course. Climbing out of Point Bravo at 40 miles I began feeling that uncomfortable lactic acid feeling creep into my legs making them feel heavy when climbing uphill. Andrew was climbing better than me and now I was feeling the hurt on the climbs. Most of the climbs required power hiking from all runners, and I was just trying to make sure Andrew wasn't power hiking faster or running sections that I couldn't. I was frustrated that I didn't feel good running uphill, as I usually feel much better going up, even if slow, than I do going down but during GDR I experienced the opposite. With eight miles between Point Bravo and the next aid station at Fish Gap I wanted to make sure I stayed present and stay aware of what I needed. My mental focus began to think less about "racing" and more about how to take care of myself and persevere. Although I was heavy going uphill, my legs were strangely still fresh. I was propelling forward with strength over downed logs, shifting well between rocks and roots. About a mile before Fish Gap aid station at mile 48 I caught a glimpse of Kilgore ahead on the trail. He was noticeably haggered, staggering up the 20-25% grade mountain. I gained on him quickly as I was running and gave him some encouragement as I passed. He barely uttered a sound. I glanced back a bit later when I was further up the hill after hearing a voice and he had called someone on the phone. His day was done and I was in 2nd place. 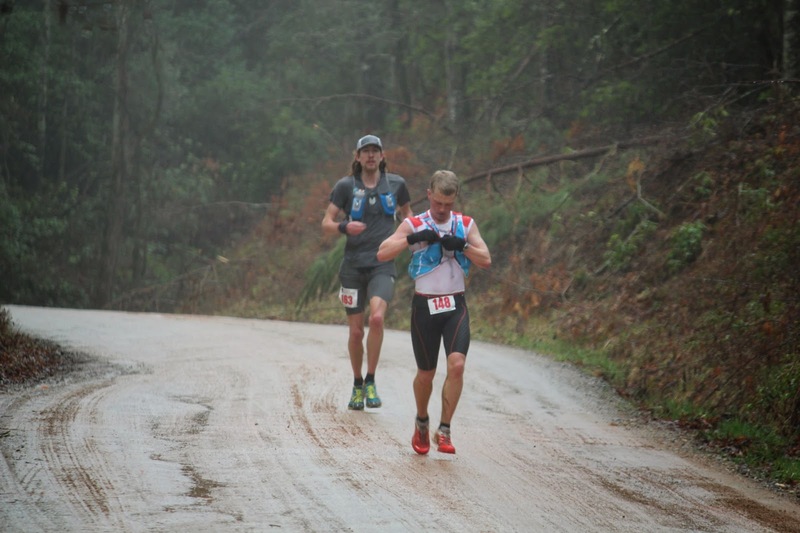 Although I was encouraged to move into 2nd place, I learned at the Fish Gap aid station that Andrew had put about 12 minutes on me in the 8 miles from Point Bravo and was now 13 minutes ahead! I thought it was incredible that he must have ran the toughest part of the course to this point so strongly. From Fish Gap to Mulky Gap just 2 miles away where my crew would be waiting, I set my sights on what was ahead. Since getting onto the Duncan Ridge Trail (DRT) some 3-4 miles earlier from the BMT, it was noticeable that the DRT was much more rugged and "wild." I knew there was still even more rugged and steep hills ahead, especially going up Coosa. I ran out of Mulky hard with the intention of trying to gain ground on Andrew in the 4.5 miles to White Oak Stomp aid station. Now that there was about 13 miles left in the race, being down 15 minutes to first place, if I couldn't make up distance now, there would be no chance unless Andrew really hit the wall. This would still have required over a minute per mile faster in order to catch him. So I put my head down and just sort of got over the dead leg feeling as I climbed more hills than I had since getting on the singeltrack 20 miles earlier. I felt confident that no one else was gaining on me, but was warned by RunBum that some guys might be coming strong. Running into White Oak Stomp the guy at the aid station told me I was 5 minutes behind Andrew - BUT the lady with the clipboard quickly corrected him and said I was still 15 minutes back! No time lost to him in this section, but also no progress in cutting into his lead. Now there were 9 more miles to the finish, with the hardest climb up and over Coosa Bald, and the highest point on the course at 4200+ feet. After Coosa, there is a quad-crushing 2200' descent in just 4 miles. The climb up Coosa was about a mile in 19 minutes - I was pretty happy with this. On the way back down I started to feel that ache in my quads but I was so close to the finish now that I just let go and ran hard. I still stayed pretty slow on the descent because of some technical sections but for the most part I was happy to have the legs to run down decently. At the bottom of the long descent was the last aid station at Wolf Creek, mile 60 with about 3.5 miles to the end. I was still about 15 minutes behind Andrew and I gave up hope on catching 1st place. I was happy with 2nd place at this point, but still wanted to run the last 3.5 miles strong in case someone was coming from behind. With still an 800' climb over the next 1.5 miles I set small goals of running hard for 2 minutes and then walking for a minute. After doing that a couple time I realized my legs were fine enough to just slow it down and keep a steady pace all the way to the finish. Running into Vogel State Park was a nice feeling, as the finish of every ultra is, to see the hard work be rewarded with the finish line. Andrew had finished approximately 20 minutes prior to me, with over an hour off of the old course record, and I was 2nd place in 10:47:00. We spent a couple hours at the finish line. I received my railroad spike for finishing and a cutting board. I was happy to see Travis finish in 3rd place just 15 minutes behind me and know that it was a good thing that I ran hard the last 9 miles. It wasn't until we were pulling out of the parking lot that 5th place was finishing. I like to stick around after races longer but I was getting cold and chilled and wanted to get back to the cabin to get a hot shower and then food. When I was trying to get to sleep with a restless mind and body, I suddenly got super-chilled and developed a fever. My body was hot but I felt cold inside. It wasn't a very good feeling. To make things worse my stomach felt turned upside down like I needed to puke, but I couldn't. I was a bit worried with how I felt, and started to wonder what could be wrong. Bobbi gave me some fever reducer medicine that she found and luckily I was asleep in no time. When I woke up, no signs of fever and I felt normally, besides some soreness. A few days after GDR now and I feel like I do after a typical race of this distance. My muscles are fairly recovered and I am happy that no injuries developed. The worse part is a black toenail caused by jamming into a rock early in the race. I've tried to get some active recovery in and going to rest a bit more before running again. 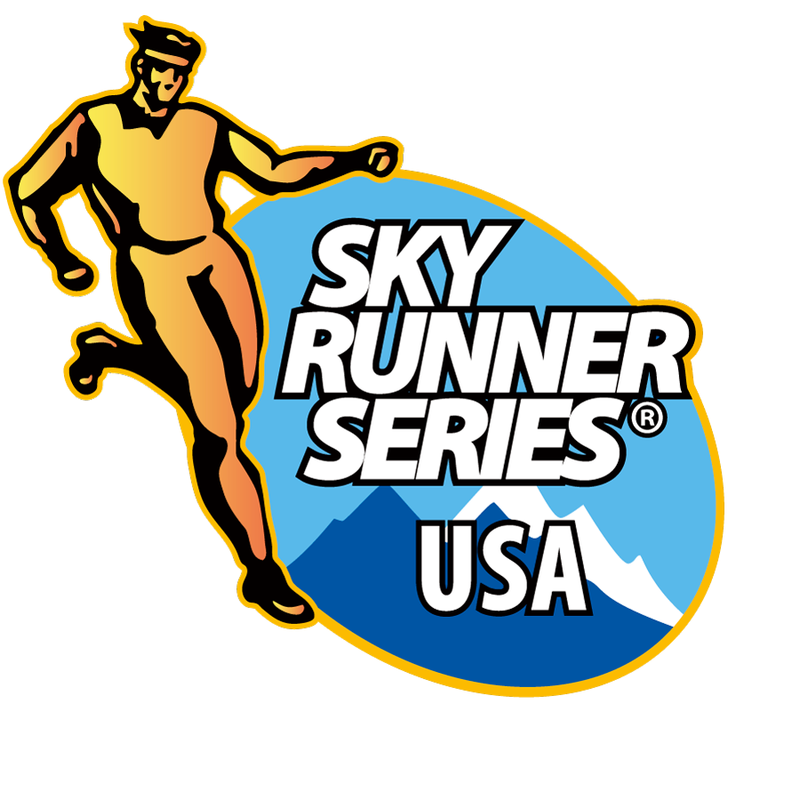 The next race is the Quest for the Crest 50K, second race of the US Skyrunner Series, about 13 weeks away. Time to get fully recovered before putting the training in for the Quest! A big thanks deserves to go out to my wife Bobbi and sister Becca for trekking all the way down to Georgia with me and crewing during the race. They were only able to see me at 3 aid stations but the support and chance to get some replenishment was much needed and appreciated. The race staff, even though thrown off a few days before the race with changes, had everything under control on race day. The course was marked great, and the aid stations were prompt and encouraging. It is also really amazing to have all the support and encouragement from back home in Ohio from family and friends. I think about it during races and it helps when I'm out on the trail. I also want to thank Larry and Patty Clay, Bobbi's relatives who happen to live 10 minutes from the finish line, for opening up their home and giving us a place to stay before and after the race. This made things very comfortable! Lastly, I want to thank my sponsors who provide a lot of support to make training, racing, and recovery a lot more efficient and possible! UVU Racing: You Versus You - some of the most high quality apparel for runners that worked perfect during GDR. Ugo Bars: Since working with Ugo I've really enjoyed eating such a healthy and natural nut bar almost daily, especially right after runs and workouts. I've developed a nice craving for the new Wanderlust Bar! Swiftwick Socks: I wore the Swiftwick Performance Two's during GDR and didn't have any problems on my feet except for jamming my big toe on a rock on a technical downhill. Otherwise, my feet were top-notch after another ultra with the wicks. SOS Rehydrate: I've been training with SOS since the new year and I've been really happy with it so I implemented into my race strategy for the first time at GDR. To be exact, I drank 88 oz. of SOS during the race and after most training runs since December! It went down smooth and I never got tired of it, and think it helped rehydrate my body on the humid day. Julbo USA: With all the snow Ohio had in February, it was nice to have Julbo there for protection from the bright snow reflection. I'm looking forward to hitting the summertime trails with the Julbo Dusts because they feel and look so good! Honey Stinger: It has been great training with Honey Stinger products since the new year. During GDR, I really keyed in on taking the Organic Waffles early in the race so I would feel comfortable taking gels later. All in all, I stayed on top of my nutrition all race the the Honey Stinger taste was great. Blue Ridge Outdoor Magazine: BRO Magazine has recently formed their first-ever BRO Athlete Team to support some local athletes of the Blue Ridge area. Although I'm on the fringe of the Appalachian Mountains, they have added me to the team and I'm honored to be a part of it. Check out their website and pick up one of the publications.